All countries and nations have their favourite dishes, which have long stepped over the national boundaries and because of their virtues have suited everybody�s taste. Suffice it to recall Hungarian goulash, English beefsteak, Austrian schnitzel, Russian boef a la Stroganoff and others. But not everybody can boast of what one might call the national cuisine-a list of dishes differing in gustatory sensation and slightly similar in some qualities. People throughout the world know French cuisine notable first of all for its exquisite sauces; Russian cuisine known for appetizing fish dishes, pies and pancakes; Chinese cuisine differing from all others in using uncommon products and possessing quite a specific taste of its own. Georgian cuisine uses well familiar products but due to varying proportions of its obligatory ingredients such as walnut, aromatic herbs, garlic, vinegar, red pepper, pomegranate grains, barberries and other spices combined with the traditional secrets of the chef �s art the common products do acquire a special taste and aroma, which make Georgian cuisine very popular and unique. 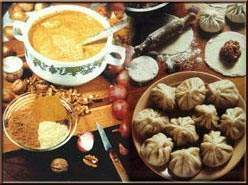 Georgian national cuisine is notable for an abundance of all possible kinds of meat, fish and vegetable hors d�oeuvres, various sorts of cheese, pickles and pungent seasonings, the only ones of their kind. A guest invited to the Georgian table is first of all offered to eat the golden-brown khachapuri which is a thin pie filled with mildly salted cheese; then he is asked to try lobio (kidney bean) (ripened of fresh green beans) which nearly in every family is cooked according to its own recipes; stewed chicken in a garlic sauce; small river fish �tsotskhali� cooked when it is still still alive; sheat-fish in vinegar with finely chopped fennel; lori, a sort of ham; muzhuzhi, boiled and soaked in vinegar pig�s legs; cheese �sulguni� roasted in butter, pickled aubergines and green tomatoes which are filled with the walnut paste seasoned with vinegar, pomegranate grains and aromatic herbs; the vegetable dish �pkhali� made of finely chopped beet leaves or of spinach mixed with the walnut paste, pomegranate grains and various spices. In East Georgia you will be offered wheaten bread baked on the walls of �tone�, which is a large cylinder-like clay oven, resembling a jar, while in West Georgia you will be treated to hot maize scones (Mchadi) baked on clay frying-pans �ketsi�. Lovers of soups will be delighted with the fiery rice and mutton soup �kharcho�, the tender chicken soup �chikhirtma� with eggs whipped in vinegar and the transparent light meat broth flavoured with garlic, parsley and fennel. Even the most experienced gourmand will not be able to resist the savoury chizhi-pizhi, pieces of liver and spleen roasted in butter and whipped eggs; crisp chicken �tabaka� served with the pungent sourish sauce �satsivi�. The famous dishes include the melting-in-the-mouth sturgeon on a spit and sauce; the chicken sauce �chakhokhbili� in a hot tomato and dressing; the Kakhetian dish �chakapuli� made of young lamb in a slightly sourish juice of damson, herds and onion; roasted small sausages �kupati� stuffed with finely chopped pork, beef and mutton mixed with red pepper and barberries. Everyone in Georgia is fond of �Khashi�, a broth cooked from beef entrails (legs, stomach, udder, pieces of head, bones) and lavishly seasoned with garlic. There exists quite a just opinion that �the onion soup in Paris and the khashi soup in Tbilisi serve the same purpose. They are eaten by the same people-by hard workers to make themselves stronger and by revelers to cure a hangover�. Remember E. Evtushenko�s lines: �Everyone who saws, transports, builds, sweeps the neighbouring streets, makes shoes, digs ditches eats khashi in the morning�. The splendour of Georgia cuisine is backed up by famous white and red dry wines, among which anyone choose wine to one�s own taste: �Mukhuzani� with a pleasant bitter taste, golden cool �Tetra� light straw-coloured �Tsinandali� with a crystal sourish touch, dark amber-coloured slightly astrigent �Teliani�, rubycoloured �Ojaleshi� with a mildly sweet, emerald-like sparkling �Manavi�, garnet-red honey-tasting �Kindzmarauli�, and dark ruby-coloured velvety �Khvanchkara�, light-green �Gurjaani� dark golden fruity �Tibaani� and many others. If to Georgian wines you add best-brand cognacs, champagne, not to mention remarkable mineral waters and fruit drinks, you can fancy what pleasure Georgian cuisine will to you. The Georgian table is conducted in a wise manner in accordance with the ancient ritual. The head of the table �tamada� is elected as proposed by the host. The tamada must be a man of humour with an ability for improvisation and a philosopher�s wisdom. If there are many guests at the table he appoints assistants who in Georgian are called �tolumbashis�. The tamada�s toasts follow one another in a strict never violated order. The guest is obliged to listen attentively to each toast and appreciate the beauty of style and the purpot of the worlds said. If is not allowed to interrupt the tamada when he is saying the toats. The tamada�s assistants and other guests may only add something to the toast or develop its ideas. If you wish to say a toast, you must by all means have the tamada�s consent or else you will find yourself in an awkward position. This table ritual does not put restraints on the guests but maintains discipline at the table. The feast proceeds among jokes and is accompanied by a dance competition, table songs and music, quotations and aphorisms from the works of poets and writers.